John was born on 27 December1807 at Salterforth, Yorkshire. He was first drawn to the Primitives during a mission led by Francis N Jersey. This was reinforced through listening to Thomas Batty who was given hospitality by John’s father. Their conversations shaped John Petty’s future life at the age of 15. 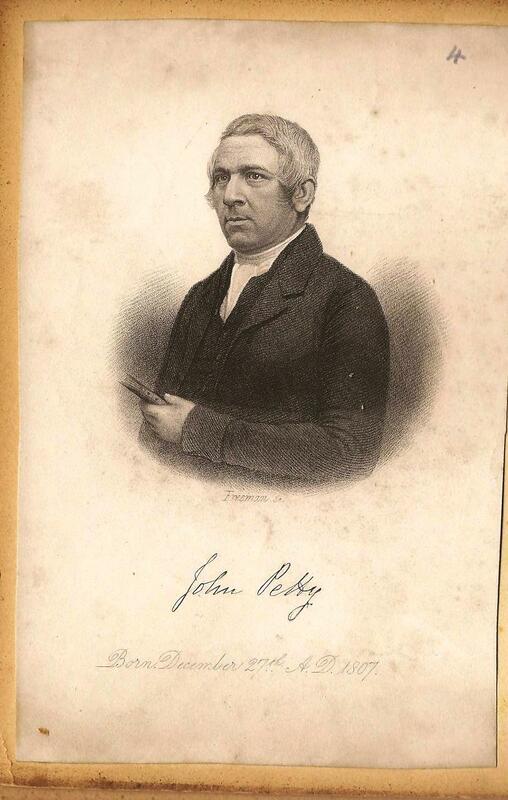 John preached his first sermon at Barley under Pendlehill in November 1823. Two days after preaching his first sermon Petty relates “John Bowes fetched me to help him in Keighley Circuit”. In 1826 the General Missionary Committee decided to continue to persevere in Pembrokeshire by sending one person. When Petty appeared before the Committee, his youthful appearance ‘excited grave misgivings’. However James Bourne had full confidence in him and he was sent arriving in Haverfordwest on 26 July 1826 to find a station with two local preachers, 11 members and one on trial. Petty persevered for two years in Pembrokeshire, the last year at his own risk when funds were withdrawn. When he left Haverfordwest was declared a circuit, although it struggled until in 1836 it was subsumed within another circuit. In the early 1830’s the Sunderland Circuit undertook a mission to the Channel Islands. This venture had a set-back when the missionary, George Cosens, upset the island authorities. John Petty was sent to repair the damage and stayed for about a year, during which time his daughter Mary was born. It was even suggested that a mission be sent to Normandy in France. John Petty was one of two who learned sufficient of the French language to be able to preach in it. The mission never came to fruition. During his placement in Hull, John Petty was behind the building of the Jubilee, Spring Bank Chapel in 1862. It was built to seat over a thousand persons. The seating must have been fully utilised because in 1878 the Ebenezer Chapel at Spring Bank was built to provide for the overflow from the Jubilee Chapel. John was Secretary to Conference in 1853 and President of Conference in 1860. He followed John Flesher as Editor, being his assistant in 1851, and holding the role in the period 1852-1856. In 1865, he became the first Governor of Elmfield College, York. In addition to directing the affairs of a school of 120 scholars, Petty was also commissioned by the 1865 Conference to tutor some twenty students intended for the ministry. Key literary works were his History of the Primitive Methodist Connexion, first published in 1860, revised in 1864 and 1880. The third edition included a supplement prepared by James Macpherson. He also authored ‘Life and Labours of Thomas Batty’. John married Thirza Sproston on 30 May 1832 in St Peter, Bradford (Cathedral). She was born on 10 February 1808 at Tunstall and died on 18 March 1871. They had two daughters, Mary born abt 1835 in St Peter Port, Guernsey, and Thirza Maria born in 1839 at Brierley Hill, Staffordshire. After working as a Governess in York after the death of her father, Mary married Rev Thomas Mitchell in 1871. Thirza Maria married Rowland George Heys in 1873 in Bradford. He was a schoolteacher. By 1911 they were running a private boarding school in Scarborough. She died in 1932. John died on 22 April 1868. Transcription of a reminiscence that was published in the Primitive Methodist Magazine 1907.